How do I view Roundme tour in VR? Roundme tours can be viewed on any device with contemporary Internet browser installed. Regardless of the screen size, you can enjoy browsing high resolution images and get the general overview of the place they were taken at. Still, if you are looking for more advanced VR experience, you may want to use the VR headset. 2) Open the tour you would like to browse. 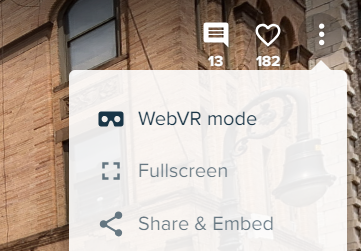 WebVR mode was exclusively designed to be compatible with a wide choice of headsets. You don't need to use your mouse or touch screen to navigate in this mode. Your view direction is updated accordingly to the data collected by the gyroscopic sensor of your device. Most of the options you need are available if just look at them for a second or two. Sensor mode. Here you can choose between the different sensor modes. The best way to choose the one you need is to test them all and find the one you like the most.